The makers of ThermaClear tell you that it is a sensational new acne treatment that you can use to clear mild to moderate acne. They claim that their exclusive thermal pulse technology can in just two seconds reach beneath the skin to kill acne bacteria while stimulating the body’s production of acne-fighting proteins so your skin clears up two to four times faster than with no treatment at all. 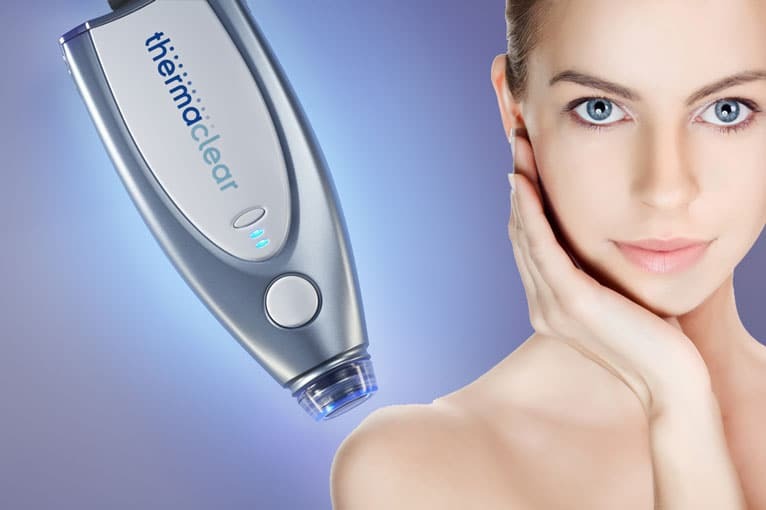 ThermaClear, marketers tell us, is very similar to laser therapy used by dermatologists, but at a fraction of the expense and none of the hassle. What are the facts? ThermaClear is a device that heats pimples, but unfortunately heating the skin does not heal it. ThermaClear is a “zit zapper” that heats pimples with a single quick jolt of heat. The ThermaClear system takes much less time to warm up and much less time to use than competing products. The problem with ThermaClear is that heating the skin does not heal it. Even heat-killed acne bacteria can still continue to cause inflammation. The healing proteins the skin uses to heal itself only emerge to the surface of the skin after the top layers have been destroyed—and do you really want to kill your skin to improve it? Most people who have acne get better results with a complete acne skin care system such as Exposed Skin Care. To use the ThermaClear acne treatment device, you first have to let it warm up for about a minute. You then apply the device to a pimple for two painful seconds. It gives the pimple a quick blast of heat, and the treatment is done. Some users note that you could use ThermaClear to treat your whole face in the same amount of time as another device requires for treating a single pimple. As “zit zappers” go, ThermaClear comes with a decent guarantee. It costs about US $150 plus shipping and taxes up front, but there is a 30-day guarantee if it does not work for you. Unlike the MyZeno system, ThermaClear does not ask you to buy a new treatment head (costing $0.40 to $1.00, depending on shipping costs) for every use. You will just have to buy a new treatment head for $19.95 plus shipping, handling, and tax about twice a year. ThermaClear is offered on reasonable terms and the company has a reputation for good customer service. But do the claims made about ThermaClear make it sound too good to be true? Let’s take a closer look. The principle of using heat to cauterize skin wounds is as old as the practice of medicine. Heating a wound to kill infection and stop circulation to the wound is a proven, if outdated, method of skin treatment. But acne isn’t a skin wound. In fact, the inflammatory reactions that cause pimples in acne aren’t really due to infection, either. The skin cells lining pores grow too rapidly. When they eventually mature and begin to slough off, they accumulate in clumps at the openings of pores. This keeps oil and acne bacteria locked in the pore beneath them. The immune system attempts to kill the bacteria by releasing inflammatory chemicals that would dissolve them. The bacteria protect themselves, however, by releasing chemotactic chemicals of their own that redirect the inflammatory attack against the skin itself, injuring the skin but leaving the bacteria untouched. ThermaClear claims that heating the skin for two minutes kills acne bacteria. There is no reliable scientific data to confirm that exactly how long acne bacteria have to exposed to heat to kill them, and no reason to believe that enough heat to kill the bacteria is not also enough heat to kill the skin. But even if Thermaclear does kill acne bacteria, scientific studies show that dead acne bacteria also release the chemotactins that redirect the immune system’s attack to healthy skin. Killing acne bacteria with heat does not stop acne inflammation. Even in the presence of heat-killed acne bacteria, the skin releases nitric oxide, which opens capillaries and causes redness, plus interleukin-8, which causes inflammation. Does ThermaClear stimulate the release of healing proteins from the lower layers of the skin? Well, yes, but before collagen is released to rebuild the skin, the immune system sends first neutrophils to irritate and dissolve the skin and macrophages to consume dead skin tissue. Healing proteins come back up into the skin from the bases of pores only after the pore after has been destroyed. And do you really think you need to destroy an acne-prone pore to save it? You don’t. Most of the people who use ThermaClear and similar products like the Zeno acne heat treatment device subscribe to the erroneous notion that there is no beauty gain without skin pain. That is simply not the case. Pain does not relieve acne. Pain makes acne worse. The neurotransmitters that convey pain messages in the skin both increase the skin’s sensitivity to testosterone, causing it to secrete more skin oil, and trigger the release of a stress hormone known as corticotrophin releasing factor, or CRF. The net effect of CRF in the skin is to trigger the release of histamine (the same chemical that causes hives) and tissue-destructive interleukin-8. Pain never improves acne, and nor does heat. So why do people use thermal devices for acne? There is a human need to “do something” in response to a problem. Skin heating devices give acne sufferers something to do. And since they typically make the skin worse, they are a gift that keeps on giving—at the expense of ever clearing up the skin. No acne heat treatment device is going to improve your skin. A blue and/or red light lamp usually kills acne bacteria and shrinks oil-producing glands, but the benefits of blue and red light treatments are due to light, not heat. Similarly, it doesn’t really help to scrub your skin vigorously. You can’t rub or scrub your blemishes away. Strong detergents can dry out the skin so that it clogs new pores. Failure to use sunscreen when using benzoyl peroxide can result in permanent darkening of the skin. And no single treatment gets rid of more than about 80% of pimples in less than about two weeks. There just aren’t any treatments, medical or otherwise, that can give you beautiful, clear skin overnight. There are acne treatment systems, however, that get rid of about 95% of pimples in 30 days, by combining cleansing, disinfection, moisturizing, skin peels, and microdermabrasion. One of the best is Exposed Skin Care—which retails for less than 1/3 the cost of ThermaClear and comes with a one-year money-back guarantee.